The HPC is a two level state of the art facility that was designed in consultation with the Australian Institute of Sport. Our onsite accommodation is the perfect place to rest your head after a long day of surfing. 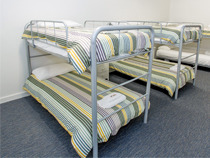 We have a total of 20 beds available and can generally keep rooms twin share for adults. Private rooms are available on request - subject to availability. We also have an onsite chaperone in place to supervise all U/18 surfers who stay at the centre. 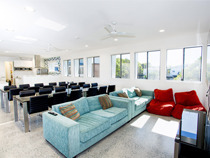 Surfers who stay at the centre have full access to the HPC lounges which are a great spot to relax at the end of each day. Smart TV's, PlayStations and complimentary Wi-Fi are available to all guests and we encourage surfers to take advantage of the lounges during downtime. We offer full kitchen facilitites for self-sufficient guests to prepare their own meals or we can arrange catering packages which are prepared and served in-house. 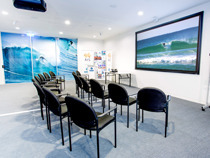 The HPC auditorium featues state of the art technology to create the ultimate video analysis experience for surfers. With cinema quality projector and premium Bose sound system, it also doubles as a professional meeting space or conference room for groups of up to 50 people. 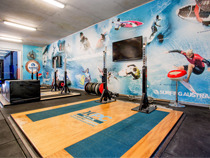 Featuring 3 Olympic lifting platforms, cable machines, free weights and a dedicated gymnastic area, the HPC gymnasium is a surf specific training space like no other. Our gymnasium is home to a stable of some of Australia's best surfers who compete on the World Qualifying Series (WQS) and World Championship Tour (WCT) but it is also open for introductory sessions on selected surf camps. The team of ASCA qualified coaches can help you become a stronger, more powerful surfer. Getting on the right equipment is arguably the most important part of surfing but not every surfer has the opportunity to try different boards. The HPC surfboard room is open to anyone who does a coaching program, with 35 surfboards available from two world class shapers: Darren Handley (DHD) and Matt Biolis (Mayhem). There is also a full selection of FCS fins for surfers to try different board/fin combinations and fine-tune their equipment. This world leading indoor construction consists of a large split level half pipe and two roll-in elements. Two matching sections simulate the shape of a wave to provide the rider with a launch pad to take to the air before landing safely on air bags below. The facility will provide surfers with the opportunity to practice aerial manoeuvres in a controlled environment.